TROUBLE! Mason is pulling himself up on the crib bars. He's sinking his teeth into the dining table. He's tearing pages out of books. He likes animal crackers. He adores soy yogurt, and he loves his mommy. I'm still his favorite toy. Finally the weather we've been waiting for is here. This is my year for yard improvement. I've been in this home for nearly two years. The first year I dedicated my efforts to the inside of the home. Last summer I worked on the baby's room, and much of my energy was spent on the adoption process. This summer has been and will continue to be all about the yard. It feels a lot like the house did: the more I do, the more I see needs to be done. 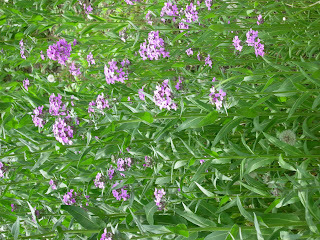 The purple flowers are Minnesota wild flowers I planted in the back last fall.